Army researchers have developed a simple, comfortable, wrap-style respiratory protective mask for protection against riot control agents. 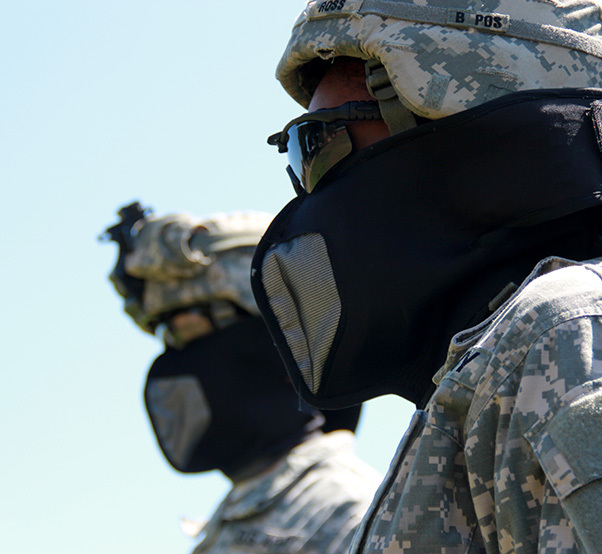 Army researchers have developed a simple, comfortable, wrap-style respiratory protective mask for protection against riot control agents, and the U.S. Army Edgewood Chemical Biological Center, also known as ECBC, is making it as a simple as putting on a surgical mask. ECBC researchers Dave Caretti, Dan Barker and Doug Wilke developed the idea for the solution from specialized operators, who expressed a need for a protective mask to protect against riot control agents such as 2-chlorobenzalmalononitrile, also known as CS, or tear gas. The operators also wanted a mask that could protect users who have beards, or must operate with other unique head-borne equipment. Currently, users wear a traditional full general protective mask when disseminating riot agents. This mask is a hard material and the user must remove any existing equipment on their face to put it on. This process can take time that operators might not have during emergency situations. “The solution we envisioned would easily integrate with the user’s helmet, communications headphones and protective eyewear, so that it could provide a simple solution for all users,” Caretti said. Members of law enforcement, who use CS and other riot control agents, could also use this type of mask when necessary and avoid wasting time with a traditional full-face piece respirator that requires the removal of protective helmets and other head-borne items. To begin work on this proposed solution, Caretti, Barker and Wilke entered their proposal for the mask they called the “Integrated Respiratory and Eye Protective Scarf,” or IREPS, to the research center’s Internal Innovative Development of Employee Advanced Solutions Program. The program is designed to support innovative employee proposals during one year. The idea was accepted to the program and the team had one year to make a difference. First, the team started to do research to understand more about CS. The team partnered with commercial vendors to get donations of materials that protect against particulates and vapors. 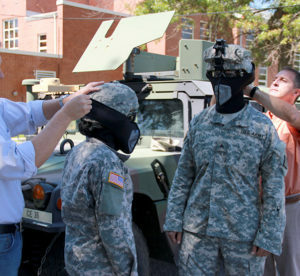 Army researchers Dave Caretti, right, and Dan Barker, left, instruct and assist two soldiers using the innovative mask. The scarf-like system could protect users who have beards, or must operate with other unique head-borne equipment. Next for the design, the team partnered with the ECBC engineers and another engineering design shop experienced in making soft-good items for sportswear applications, to develop several different IREPS models that the team shared with the user community. The final design is a simple, comfortable wrap that can be donned without removing any head-borne gear. The wrap includes a material with one-way stretch and can be pulled around the user’s headphone ear cups, as well as the back of the protective helmet for full protection. The filter component passed the National Institute for Occupational Safety and Health, or NIOSH, standards for protection from a CS riot control agent and demonstrated a filtration capacity of up to 140 minutes. “We got so much done. We collected data on the media; the wrap design worked well for the user gear; we got the protection levels above standards from NIOSH. The last thing we had to do was integrate IREPS with the operator’s eyewear,” Caretti said. Eyes are very sensitive, so protecting them is a critical part of any protective mask. Finding a way to integrate eyewear with the rest of IREPS was the crucial last step. In an attempt to create a solution that could adapt to a sunglass style, the team looked at putting gaskets similar to what you might find on swim goggles on the sunglasses, which would then seal around the eyes to the face. While the preliminary concept for the eye protection seemed like it could work with some modifications to minimize lens fogging, the user community still needs to determine if such an approach is something that could truly be functional. Unfortunately, the one year program came to a close before the team could fabricate prototypes for that final step. Caretti, Barker and Wilke are still engaged with the user, who is still interested in the prospect of a more flexible, beard-friendly protective mask.